I am in a bookclub, so I am always reading something. 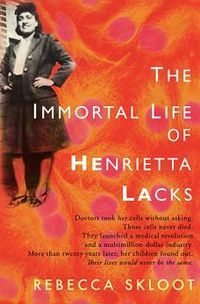 This past pick was The Imortal Life of Henrietta Lacks by Rebecca Skloot. I heard alot of good things about this book so I was curious. I wanted to like this book, I really did. I tried so hard to like it, to try to understand it, to try to follow it but it seemed to me like I was just trying desperately to trick myself into being entertained by my biology class textbook. I wanted to read a story. I thought this was supposed to be the story of Henrietta Lacks, I mean her name is in the title! It really felt like I was jumping back and forth between a biology lesson (which I really dont mind) and a story about trying to tell a story but having an awfully hard time telling the actual story. Did we really need to spend a whole two pages describing how the author sat in a hotel room in Baltimore waiting for Henriettta’s son to call just to find out that he doesn’t actually call? Did we need to follow that with randomly driving to some distant relative’s house who spent another 5 pages telling the author absolutely nothing other than the fact that Henrietta may or may not be buried in a nearby cemetery and kicking dirt around?